The Singalila range is one of the rare spots on earth where the view embraces five summits rising above 8000m, amongst them Everest, Makalu and Lhotse. The Singalila trek takes you along the Singalila ridge. 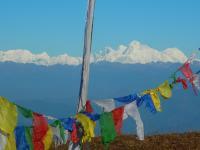 This trek offers breath-taking views of the Himalayan range from Cho Oyo to Kanchenjunga. The trek along this ridge going through small settlements is renowned for being one of the most scenically rewarding in the entire Himalaya from the mighty Everest in Nepal, to the revered Kanchenjunga in Sikkim and the legendary Chomolahari in Bhutan. During this trek you tread along the 19th century old English lord trails, along the Indo-Nepali border crossing jungles and rhododendron forests. The touch of culture with the visit to Sikkim monasteries makes it a rare venture.